A guest post by Master’s student Zoë Ogahara. Videos produced by Zachary Strain. Classrooms in the EU are becoming more diverse, creating a wealth of learning opportunities but also presenting specific challenges. To put this in perspective, there are 5.4 million child migrants in Europe and children constitute over half the refugee population, according to UNICEF. While teacher training in special needs education (e.g. dyslexia) is often extensive, teachers are rarely given the specific knowledge and skills that will help them create the best educational outcomes for all in diverse classrooms. Such skills include teaching their native language as a foreign language, helping students deal with trauma, and methods to promote intercultural understanding. These skill and knowledge gaps will have to be explicitly addressed to achieve SDG4, inclusive and quality education for all. Enter the Erasmus+ HESTIA (Helping Students in Acceptance) Project, a partnership of Maastricht University and five schools across Europe. This ongoing collaboration aims at sharing best practices for human rights education and the inclusion of migrant students in the classroom, combined with big ambitions for making wider changes for teacher training in Europe. To this end, the six partners of the HESTIA Project met in Maastricht for the first Learning, Teaching and Training meeting of the project. Teachers from schools in Belgium, Greece, Italy, Portugal and Spain took part in a week of workshops and school visits organised by the Maastricht University partner, which is based in the migration research group at UNU-MERIT. Taking place outside of a school, there was an opportunity to reflect on issues of migration and integration in their wider context. The sessions began with a thorough grounding in these subjects led by Prof. Melissa Siegel and Veronika Fajth of UNU-MERIT. Although many HESTIA countries are located in southern Europe, participants were surprised to discover that they had very different migration profiles; for example, the five largest immigrant groups in neighbouring Portugal and Spain are entirely different. The participants learned about motivations for migration and the differences between asylum seekers and refugees, as well as the different approaches to integration that countries have taken. From here the programme had a greater focus on the role of education in the integration of migrant students. Prof. Melissa Siegel began with a lecture on the research into the policies that are most favourable to reducing the achievement gap between native and migrant students. This led to fascinating comparisons of policies in place in HESTIA countries. The teachers noted that many of the policies that disadvantage migrant students are present in the school systems in which they operate: for example, both the Netherlands and Belgium have early tracking systems whereby students are ‘tracked’ into academic or vocational pathways at a relatively young age. 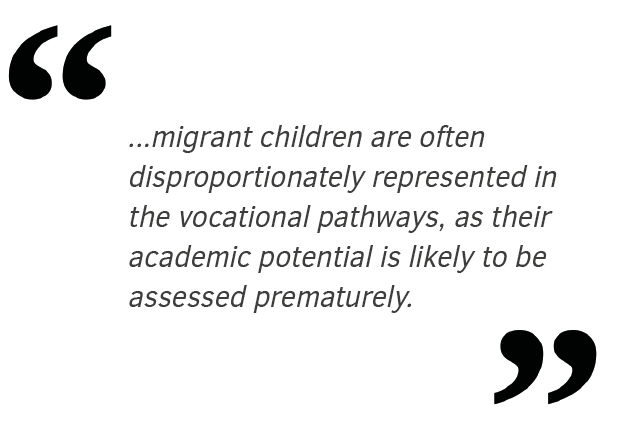 In these systems migrant children are often disproportionately represented in the vocational pathways, as their academic potential is likely to be assessed prematurely. Placing the importance of education and integration in a wider context, in a workshop from the Conflict Education and Learning Laboratory (CELL), Ayla Bonfiglio outlined how divisive and dehumanising stereotypes often lead to conflict and violence. Stereotypes that depict groups as ‘inferior’ or ‘not like us’ are often normalised by inclusion in educational materials. Following this talk there was an emotive discussion regarding the central role of teachers in addressing difficult topics with their students in a healthy and open way. We heard of the particular case of teaching in Barcelona following the Catalan independence referendum, where parents and government have placed pressure on teachers to avoid political subjects. Delfos further spoke about creating cohesion in the classroom, stressing the importance of listening and communication. She also delved into her work as a therapist helping children with trauma. The silence in the room during this talk reflected how important the group regarded this lecture. Delfos urged teachers not to shy away from counselling their pupils, and to make schools ‘safe places’. Over the course of the week the teachers learnt more about best practices of the Dutch education system. They were able to talk to Nancy Nicolson and Birgitte Kroon-van Soest who work at the Maastricht ISK-EOA, a transition school for secondary school age students who arrive in the Netherlands without speaking the language, many of whom arrive as asylum seekers. In the final days of this intense week of workshops, the HESTIA project participants visited the United World College Maastricht, the ISK-EOA, and OBS De Regenboog. Despite the differences in the schools that were visited, and the various education policies of the HESTIA countries, it is clear that teachers across Europe want to have the skills and the space to celebrate different cultures, cultivate positive relationships, and attend to the needs of each of their students.